Check out Tobi's Caitlyn Cat Collar Tee Add a T to transform a tee: who knew? The White Caitlyn Cat Collar Tee comes in stretch rayon with a deep v neckline and T-strap detail. The weekend routine just got a bit less basic. Pair this comfortable t-shirt with leggings for a killer athleisure look. Add a T to transform a tee: who knew? The White Caitlyn Cat Collar Tee comes in stretch rayon with a deep v neckline and T-strap detail. The weekend routine just got a bit less basic. Pair this comfortable t-shirt with leggings for a killer athleisure look. Add a T to transform a tee: who knew? The Black Caitlyn Cat Collar Tee comes in stretch rayon with a deep v neckline and T-strap detail. The weekend routine just got a bit less basic. Pair this comfortable t-shirt with leggings for a killer athleisure look. Add a T to transform a tee: who knew? 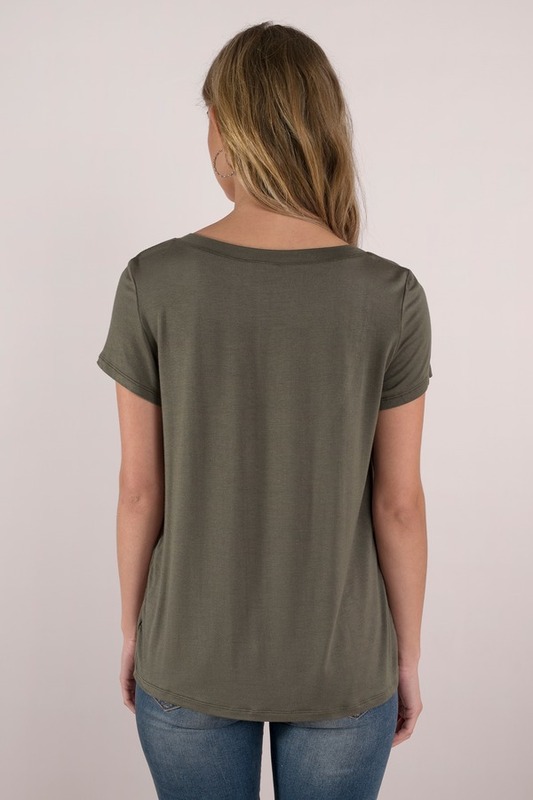 The Olive Caitlyn Cat Collar Tee comes in stretch rayon with a deep v neckline and T-strap detail. The weekend routine just got a bit less basic. Pair this comfortable t-shirt with leggings for a killer athleisure look.